Fabian Prada, Misha Kazhdan, Ming Chuang, Hugues Hoppe. ACM Trans. Graphics (SIGGRAPH) 37(4), 2018. Fast processing of surface signals directly in texture domain, avoiding resampling. Abstract: Processing signals on surfaces often involves resampling the signal over the vertices of a dense mesh and applying mesh-based filtering operators. We present a framework to process a signal directly in a texture atlas domain. The benefits are twofold: avoiding resampling degradation and exploiting the regularity of the texture image grid. The main challenges are to preserve continuity across atlas chart boundaries and to adapt differential operators to the non-uniform parameterization. We introduce a novel function space and multigrid solver that jointly enable robust, interactive, and geometry-aware signal processing. 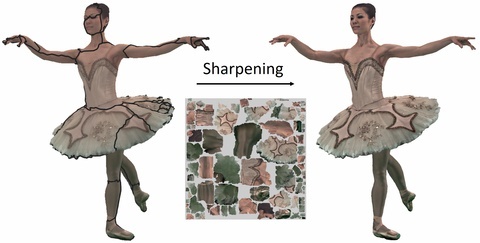 We demonstrate our approach using several applications including smoothing and sharpening, multiview stitching, geodesic distance computation, and line integral convolution.